Over the past decade I've spent a lot of time looking at patterns of deprivation across the UK. 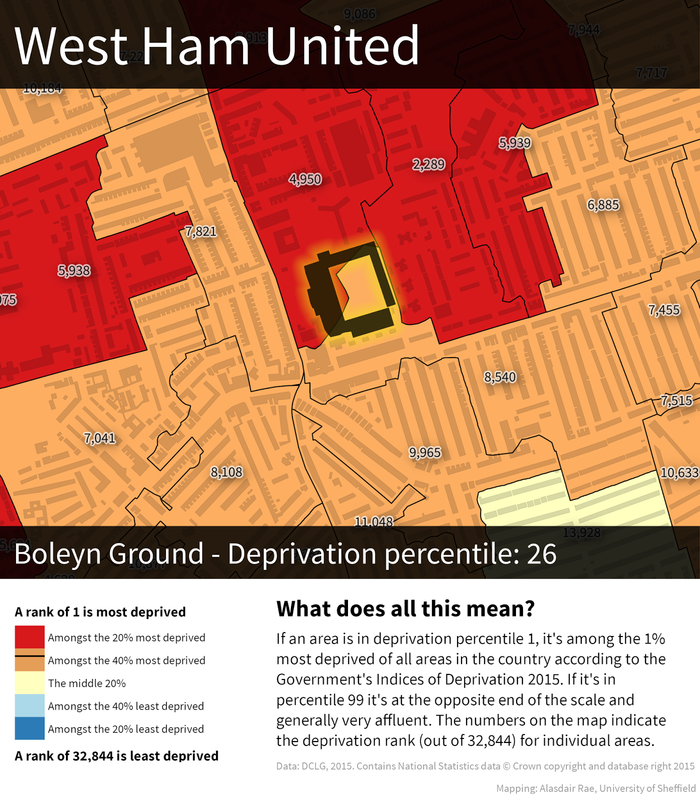 One thing I've often noticed is the way football grounds regularly appear in the very poorest neighbourhoods. 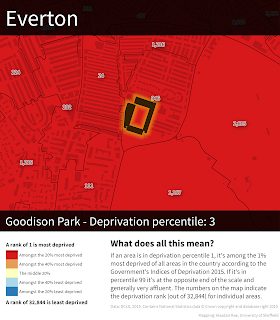 I've blogged on this topic a few times in the past, most notably in 2012 when I looked at the location of English Premier League grounds in relation to the deprivation level of their areas. 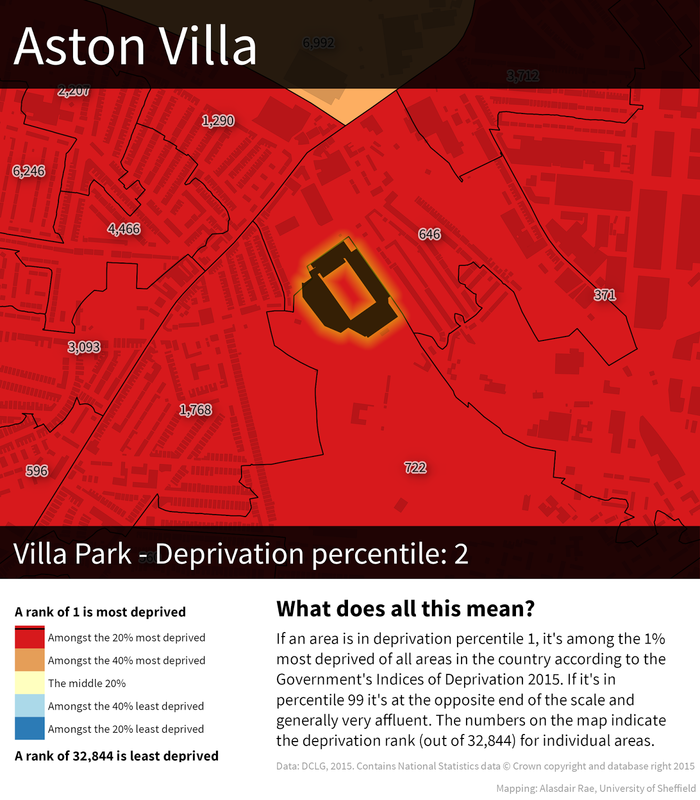 I also noticed this in relation to the Scottish Index of Multiple Deprivation when looking at the East End of Glasgow in 2009. 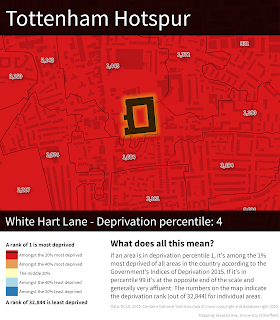 Given the history of football, its industrial working class origins, the development of British cities, and land values (to name just a few factors), none of this should be a surprise. 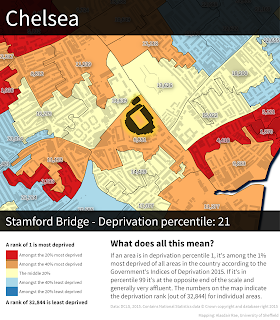 But since a new English deprivation dataset was released in September, I wanted to revisit the topic and make a few maps, just to see if anything has changed. That's what I've done here - one map showing the location of each Premier League ground and the deprivation level of the area it sits in - and its wider neighbourhood. Further explanation follows below. 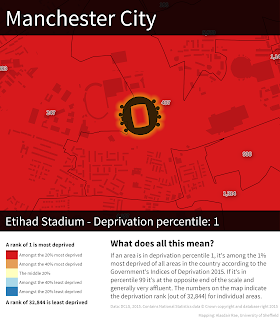 The most obvious thing to emerge from this simple mapping exercise is that more than half of all Premier League grounds are located in areas among the 20% most deprived in the country, but a good few are not. 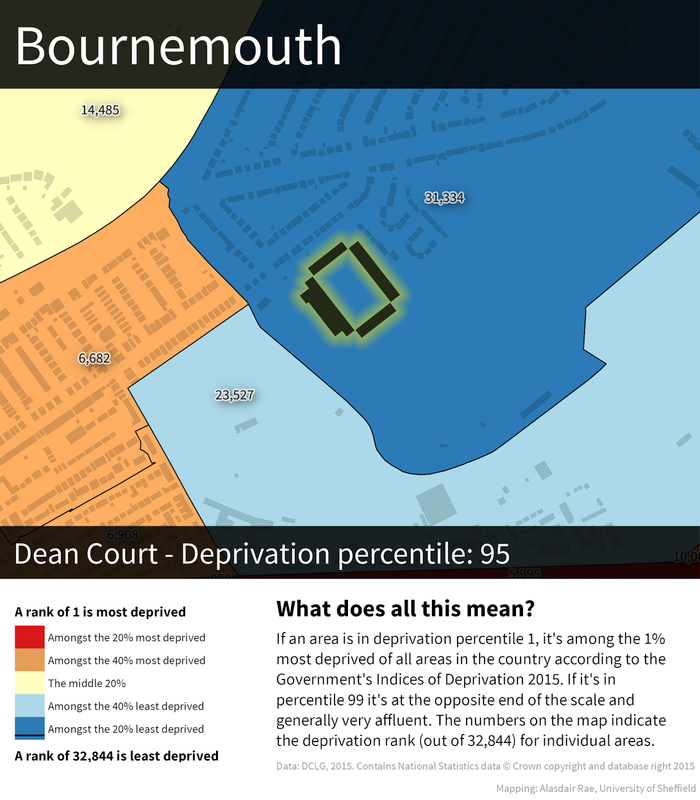 Two in particular - Bournemouth and Watford - are in much less deprived areas. 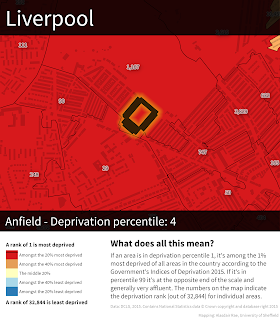 Nonetheless, if you scroll through the maps quickly, the main colour you'll see is red (for the 20% most deprived). 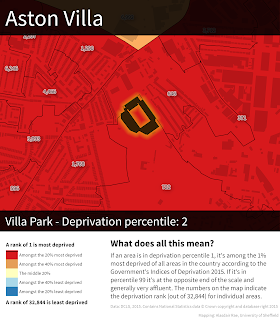 When I see stories in the news about the ability of sport to tackle deprivation, I'm generally all for it, but then sometimes I make a mental comparison between the wage bills of some teams and the neighbourhoods they're located in and I think we've barely scratched the surface of what's possible when we talk of the potential for elite sport to help transform poorer areas. Post-Olympics, this has kind of been forgotten. 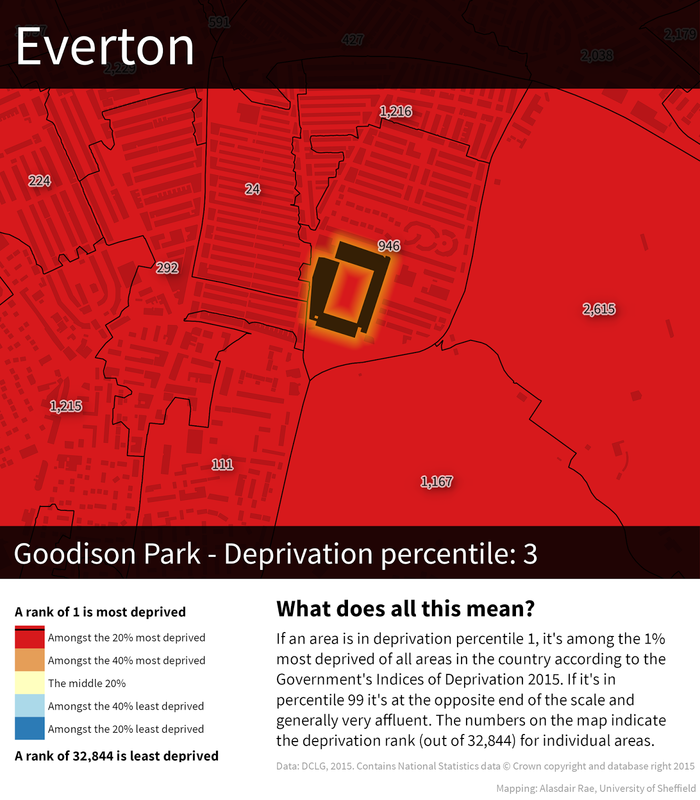 Having said this, it is good to see that the Premier League and FA's Football Foundation provides money for grass roots development in the most deprived areas as defined by this very same dataset. What does it not tell us? Quite a lot, and I wouldn't want anyone to think that I've done this to pick on any one team. 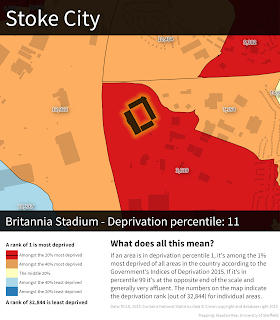 I'm just curious about the relationship between these football grounds and underlying patterns of deprivation because when I look at the data as I map it, I often notice the stadia. 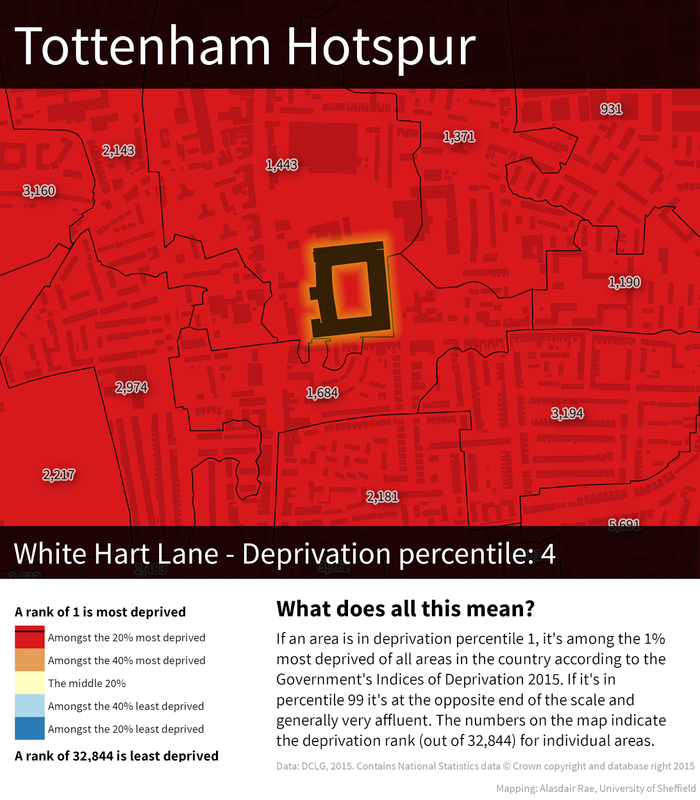 It doesn't tell us anything about cause and effect, whether teams are trying to do anything to boost the fortunes of their local areas or what the areas themselves are like to live in. If you want to know more about the underlying data, read this briefing from the Government. Does having a Premier League football team in your area make you poor? Of course not. Some of the grounds look the wrong shape - why? 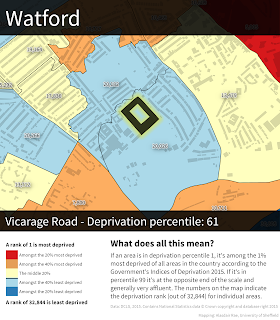 I used building footprint data from the Ordnance Survey in the maps above and the shapes of the grounds are as they were in the original dataset - with the exception of Vicarage Road, which for some reason wasn't enclosed on one side so I made my own version. 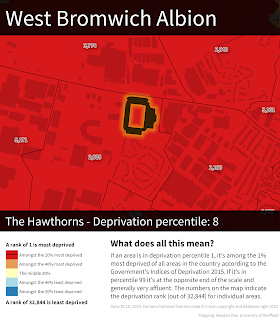 I've just added a little glow around each ground to make it stand out and then added in the footprints of all other buildings in the wider neighbourhood to help people identify nearby features and roads. 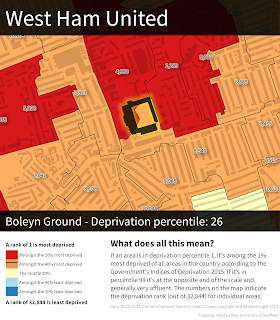 What about when a ground is split between areas? I could have taken the average deprivation rank here and used that figure but instead I chose to use the deprivation rank of the area that the majority of the playing surface was located in. 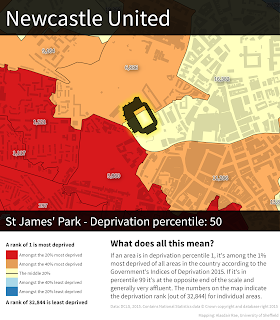 This was only really an issue for Arsenal, Newcastle and West Ham - and only really notable in Newcastle. 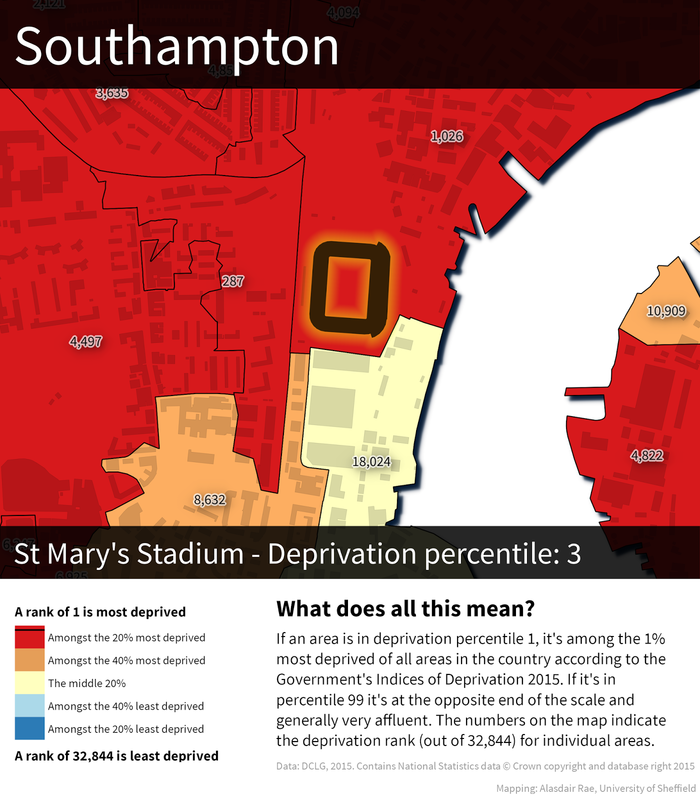 In England, there are 32,844 areas known as Lower Super Output Areas. 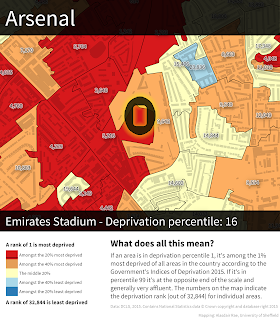 These LSOAs are small areas which the government use to report all kinds of statistics, including Census data. When they publish their Indices of Deprivation, they give each one of the 32,844 areas a rank, from 1 (most deprived in England) to 32,844 (least deprived in England). Therefore, it's a relative measure that allows us to compare one area with another, all across the country. The data are often split into five or ten chunks (quintiles or deciles) for reporting purposes but here I've decided to use 'percentiles' as it's more precise. 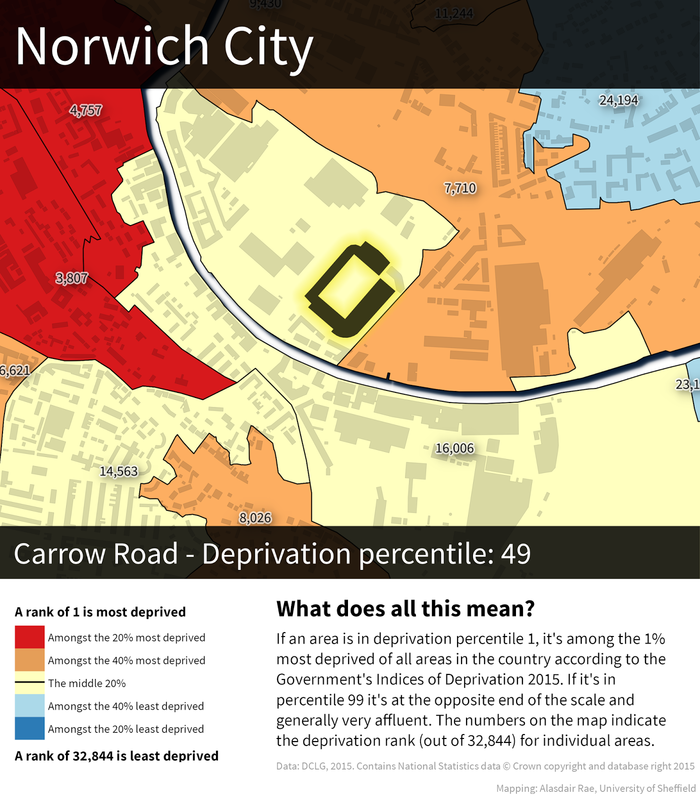 If an area is in percentile 5, it's among the 5% most deprived in England, and so on. If it's in percentile 95 (like Bournemouth's ground) then we can say it's not very deprived at all and actually highly likely to be a very affluent area. 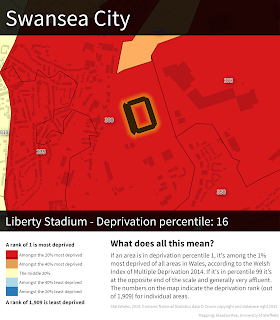 In the case of Swansea City, I've used Welsh deprivation data from 2014. 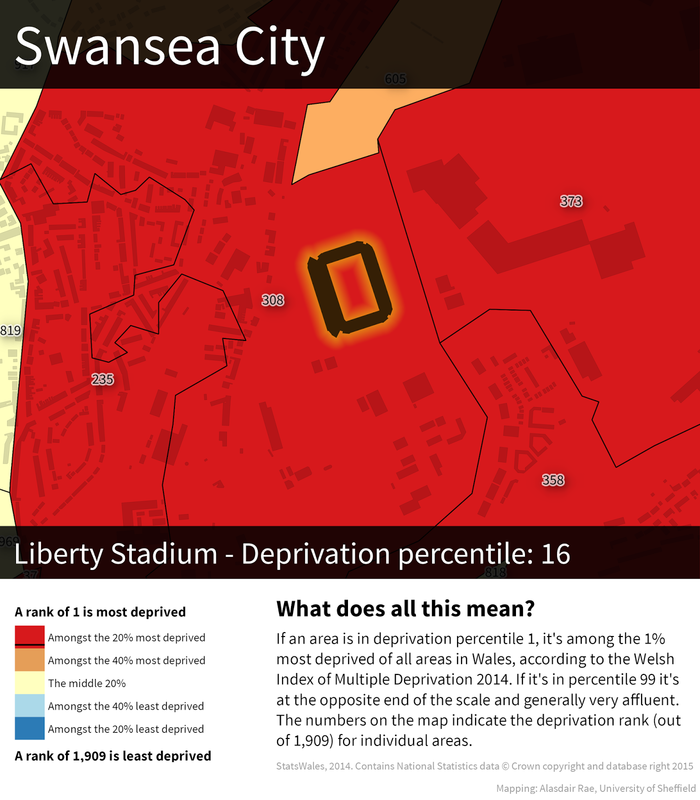 This classifies places in almost exactly the same way, although there are 1,909 areas in Wales rather than 32,844. These areas have an average population of around 1,600. Isn't this all just pointless area classification? You might think so, but the Government use these Indices to make all sorts of important decisions, in healthcare and education for example. 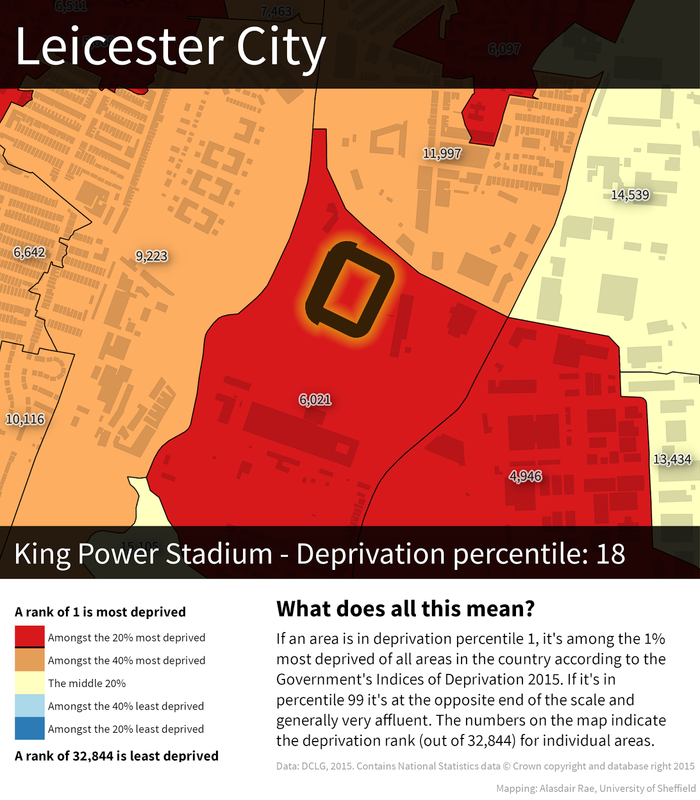 If you're in an area classified as being among the 20% most deprived, for example, you might find that you're eligible for some kind of funding - there are loads of examples of uses, with sport being one of many. 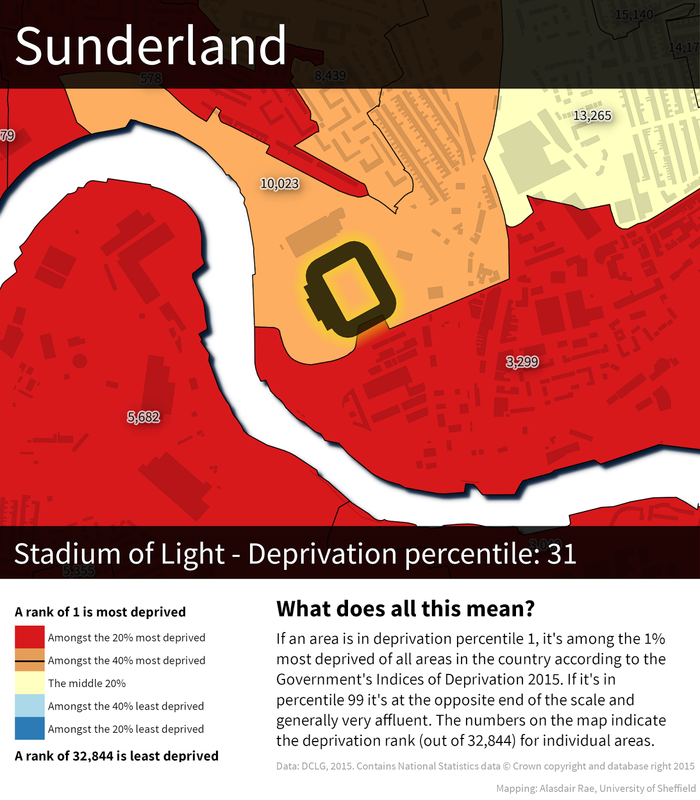 You can find quite a few other examples in section 1.4 (p. 8) of this report. 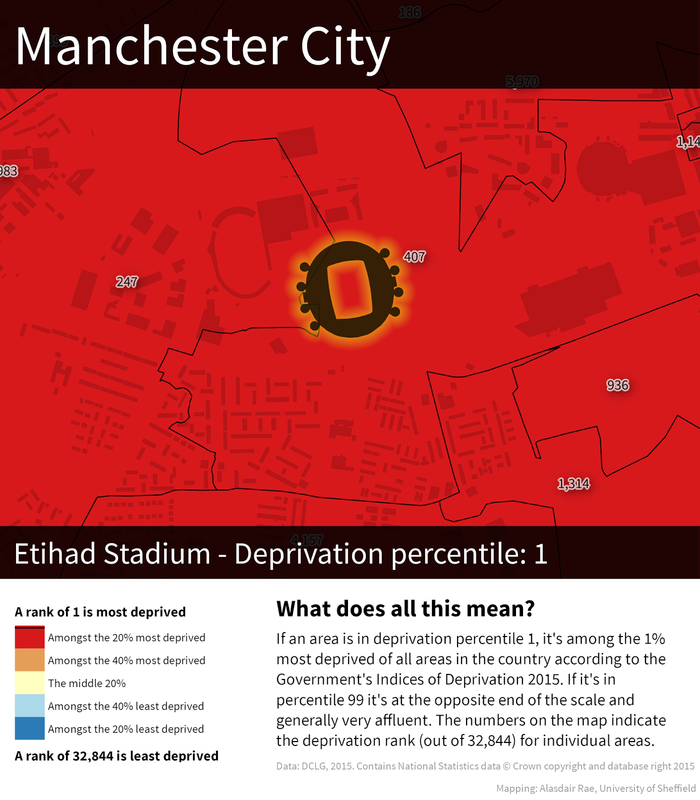 We must also remember that not all people living in areas classified as 'deprived' or 'not deprived' match that description - this dataset classifies areas not people. When are you going to expand this to include my team? I'm not planning to, but I'm sure it would be even more interesting than the Premier League. On all the maps, north is up so I couldn't help notice that Manchester United seem to be the only team playing on an east to west pitch. I'm guessing most grounds don't do this so that they can avoid the setting sun problem - and in fact Old Trafford cricket ground rotated their pitch 90 degrees to avoid this problem in 2010. 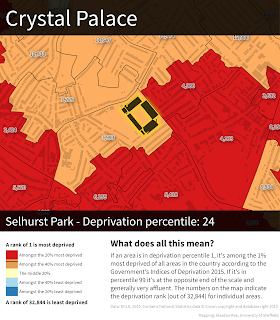 Shades of blue - representing the 40% least deprived areas - appear on only 7 of the maps, and only two grounds are in such areas. Red (20% most deprived areas) appear on 19 maps - only Watford is the exception. 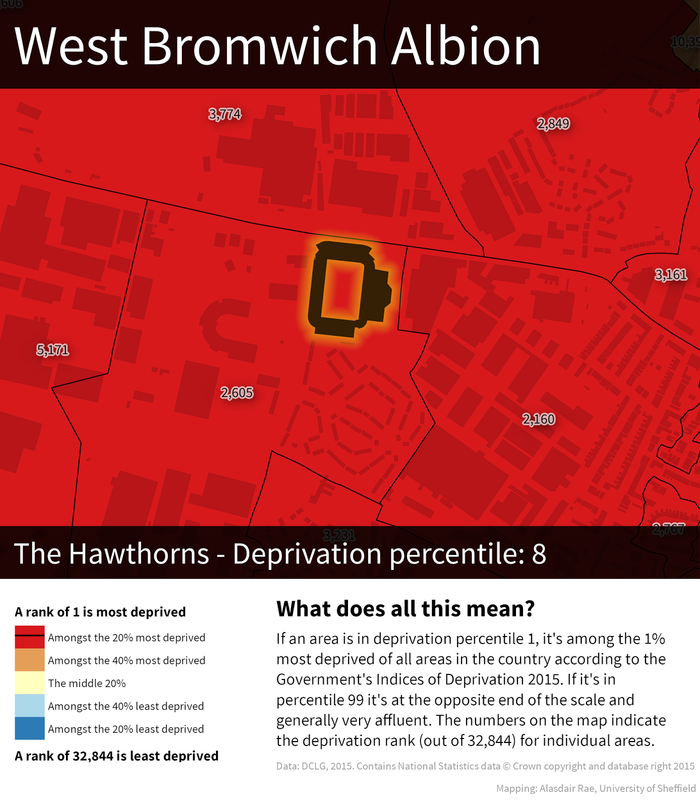 The maps for Everton, Man City, Tottenham and West Brom are entirely red - which indicates that these grounds and surrounding areas (a few hundred metres in each direction) are within wider areas classified as the most deprived in England. 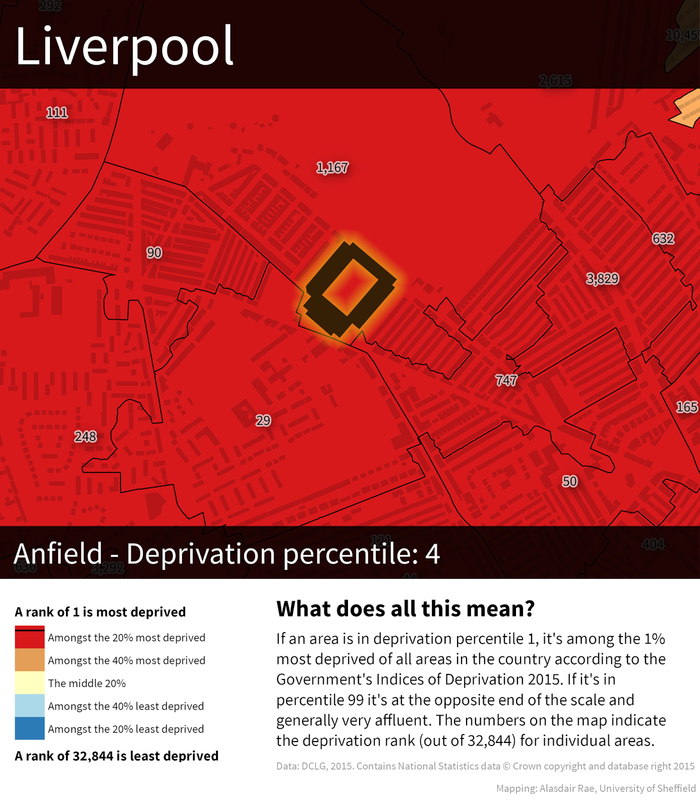 The very most deprived areas to appear on any of the maps are ranked 24 (beside Goodison) and 29 (beside Anfield). ICTFC, of course. But not very enthusiastically.